When you exhibit at Biotechnology Calendar, Inc. life science marketing events, you meet a higher percentage of qualified leads within crowds of attending researchers. 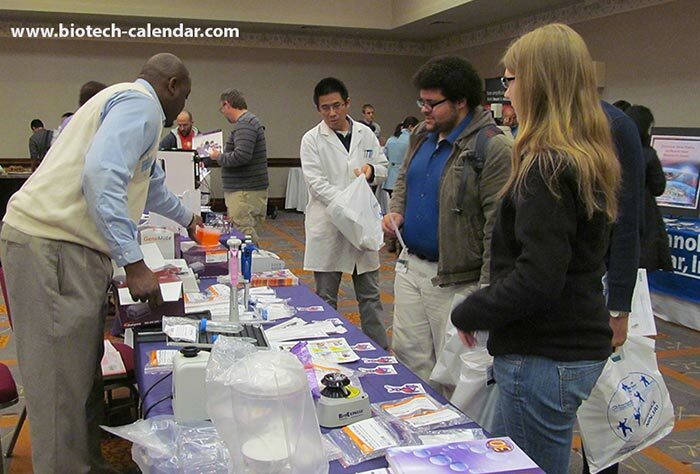 Last year, the BioResearch Product Faire™ Event at the University of Alabama attracted 326 attendees. Of these attendees, 145 were qualified leads such as purchasing agents, professors, post docs and lab managers. Working with a lead-to-attendee rate of 44%, sales representatives spend less time reaching out to attendees who aren’t qualified to make purchasing decisions in the lab and more time marketing their lab products and services to potential customers. In 2012, the University of Alabama’s life science R&D expenditures were 27th ranked in the country at $419.4 million. The University of Alabama’s 2013 NIH funding was 32nd ranked at $172.3 million. Thus far in 2014, the NIH has given the University of Alabama $204.5 million. The department receiving the most funding from the NIH is internal medicine with 120 awards totaling $64.7 million so far this year. In 2013, the NSF gave the University of Alabama $5.2 million. Researchers at the University of Alabama recently received $8.1 million in life science funding from the National Institutes of Health for a study involving the etiology of geographic and racial differences in stroke. Ranked among the top 50 public universities in the nation in U.S. News and World Report’s annual college rankings for over ten years, the University of Alabama ranked 32nd among public universities in the 2013 rankings. As a top funded research institution with hundreds of millions of dollars in life science funding available, the University of Alabama is able to keep its research labs well stocked with lab products and biotech solutions. Biotechnology Calendar, Inc.’s life science marketing event is the perfect opportunity to increase your lab product sales at this well-funded university easily and affordably. The BioResearch Product Faire™ Event at the University of Alabama will take place on November 13th, 2014. Biotechnology Calendar, Inc. is a full-service science research marketing company that organizes life science marketing events at top research universities across the United States. If you are interested in exhibiting at a vendor show closer to home, we encourage you to view the 2014 calendar of events and 2015 calendar of events. For more life science funding information on the University of Alabama, or to learn more about the Alabama event, click on the button below.